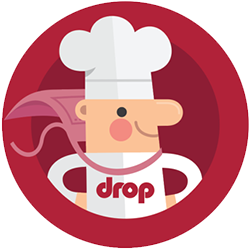 Drop — Does the app support both the Metric and the Imperial system? When you first download the app, it decides what measurements to show based on your iOS device’s Language & Region settings. You can switch from Metric to Imperial, or the other way around, at any time by tapping on the Settings icon in the menu of the Drop Recipes app. Here, under App Preferences, you’ll find the Weight setting. This is also where you can decide if you want to show temperatures in Celsius or Fahrenheit. In the recipes themselves, the amounts of each ingredient is displayed in weight (oz, g). We also show the approximate volume (tbsp, tsp, cup, etc. ), but this is only supposed to serve as a rough guideline; for perfect results, we highly recommend using either the Drop Scale or any other kitchen scale when using our recipes.